Owning chickens can be an expensive venture if you rely solely on purchased feed. Obtaining the feed will also be a problem if the transportation structure is disrupted. Since this is a real possibility, at least for a short period of time such as when storms strike, you need to know how to procure cheap food for your chickens. In addition to being ready for an emergency, most folks who raise chickens in order to get “free” eggs and meat will tell you that those eggs cost at least as much as store-bought eggs. Most of this cost is attributed to the cost of feed so if you can lower that, then it can be financially beneficial to raise chickens. The methods and foods that we discuss today will not only help in cases of emergency; they will also help decrease your costs to feed your chickens now. Another bonus is that you’ll know exactly what your chickens are eating, and in turn, you’ll know what YOU are eating! Allowing your chickens to scratch through your compost pile will help them because they’ll peck out what they like, including bugs and worms, and they’ll also turn it for you while they’re pecking. 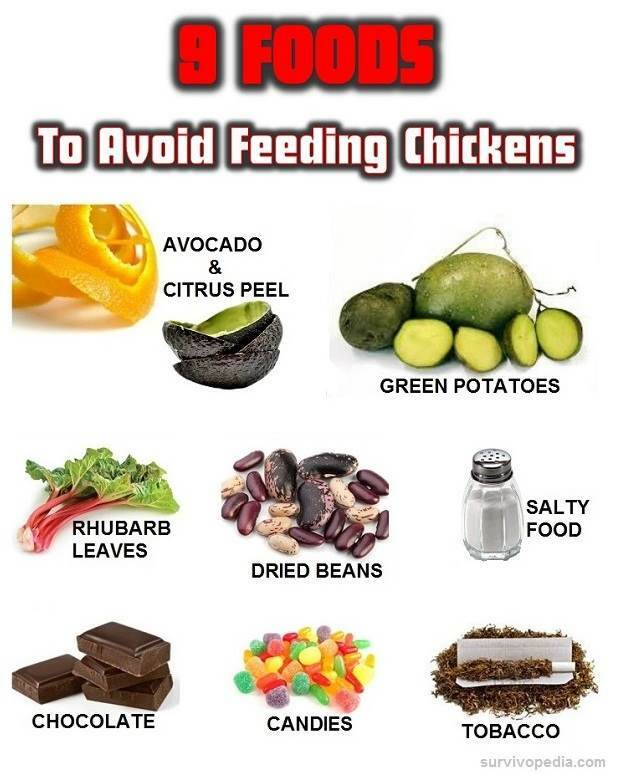 Chickens eat just about anything, including fruit and vegetable cuttings or scraps, egg shells, and even meat scraps. Just keep a bucket by the sink and take it to them in the evening. As a matter of fact, if you crack the eggshells into pieces that they can eat, that will provide the same calcium that they get from oyster shells. There are a few foods that your chickens shouldn’t have, though. Grains such as barley and hard red winter wheat, soft wheat, sunflower seeds, and oats are great for sprouting. Sprouts add extra nutrition and protein to your chickens’ diets and also make them happy, after they get used to the strangeness of it. Most grains sprout in about 5 days and the process is simple, though it does take up some space. Spread the grains in seed trays and moisten them. Keep the layer between 1/4 and 1/2 inch deep. If you start a new tray every day for 5 days, then within 5 days, you’ll have a perpetual source of sprouted grains for your ladies. During loading and unloading, bags often get ripped and the feed store is stuck with an unsellable product. Ask them about buying these at a discount, making sure that the bag is full enough to truly make it a deal. Smoothie shops, gyms, vegetarian restaurants, co-ops, grocery stores and farmer’s markets are great places to look for scraps. Some areas have laws that prohibit restaurants and grocery stores from giving away old or damaged produce, but farmer’s markets and co-ops may be a little more willing to work with you. If you have a local corn farmer, co-op or mill, ask them for the spillage, cracked corn leftovers, and older wheat that aren’t good for human consumption. Most will gladly give it to you for free and your chickens will be happy campers. Once you harvest your garden, let the ladies loose to till it for you. They’ll eat the leftover plants and weeds as well as clean out the bugs. Oh, and they’ll fertilize it for you as they go! Not everybody has this luxury, but if you can let your chickens wander the yard, do so. Of course, not every neighbor will appreciate it, and if you live in the country, they may be susceptible to roving bears, foxes and other critters that enjoy chicken as much as we do. If you can’t let them free range, consider building a chicken tractor that will allow you to move their cage over the yard so that they can have access to fresh grass, bugs, and insects. Your girls will love picking through the grass clippings and garden weeds and it’s a free source of nutrition. That fresh grass will help with nice, yellow yolks and the raked leaves make good cover for worms that they can peck for after it rains. If you have a milk cow, you’re likely drowning in milk unless you have a large family or are selling it. Use some of that leftover milk for your chickens. It’s a decent protein source and if you allow to clabber a bit, you’ll give them an extra boost of probiotics which will help with their immune systems. Yes, it’s one of the harder parts of growing chickens, but if a hen has greatly reduced egg production or is declining, it’s best to turn her into a nutritious soup instead of letting her wander around and eat without producing. Duckweed an Azola are water plants that are high in protein and vitamins, and your chickens will love them! You can grow them in a pond or a fish tank, though you won’t yield much in a tank. Comfrey is an herb that grows on land and has several different medicinal uses, including making a great tea. It’s packed with protein for your girls, so it’s a great multi-use plant to have around. Seems like a no-brainer and isn’t actually a way to create cheaper feed but now, in the real world, you can use the egg money to buy feed. If SHTF, you can trade the eggs for grain or other items that you need. Fermenting your feed is much like processing the wheats used to make beer, minus the sugar. You wet it down and let it ferment. Fermenting your feed adds protein and probiotics and makes it easier to digest. The probiotics help boost your chickens’ immune systems and a healthy chicken is a happy, productive chicken! An added bonus is that fermenting actually produces a pre-fertilized seed (if you use seeds) once it’s made its way from one end of your chicken to the other! Place the food in a quart jar or a plastic container with a lid (gallon or 5-gallon buckets are great). Don’t use metal. Your container size will depend upon how many chickens you have because you’re going to put 3-5 days’ worth of feed in it. After you put the feed in the container, cover it with water so that there’s at least an inch of water above the top of the feed. Since the grain or feed will absorb the water, check it after a day or so and add more water if necessary. The layer of water helps keep it from molding. The next day, do the same thing in a new container, and start a new one for a total of 5 days. Cover them with a towel or loose lid. On day 4, feed the first batch to your girls an start a new batch in that container. An alternative is to just make one big batch and keep adding water and grain to it as you feed it. Since we only have a few chickens, the jars work best for us. Growing fodder takes sprouting a step further. You actually grow the grass from the sprout until it’s a few inches tall, then feed the whole thing to your girls. They get the benefits of the grass, the seed and the roots, so it’s an extremely delicious and nutritious way to stretch your grain. You’ll get about 25 pounds of fodder from 5 pounds of grain and it only takes a few days. Spread the seeds in a 1/4-1/2 layer in a pan with holes in it. You can build a stacking system using some PVC pipe so that you can water from the top and let it drain down through a few layers into a catch pan. Of course, you can use just the sprouts, too! 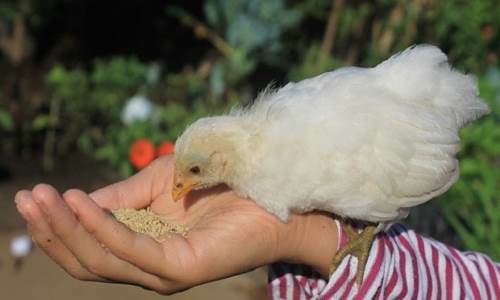 Did we miss anything about feeding your chickens on a budget? Do you know some old ways to feed the chicken healthy that we haven’t heard about? If you have other ideas or want to share your knowledge, please do it in the comment section below! If i see cheap lettuce or cabbage in the shops i pick one up and bring home and hang it in the chook house whole, from a string and they peck at it. It moves around, swings around and creates interest as well as food.